The wealth of Maori business is estimated to be around $37 billion but with 60,000 Maori children living in poverty, Mana MP Hone Harawira has suggested to iwi leaders that “maybe it was time we turned our corporate bus around and went back to get all the kids”. Union Hard! This slogan from the locked-out and striking men and women of the Meatworkers’ Union had real meaning over the summer and autumn of this year – for twelve hard weeks they faced off against a company determined to break their union. Talley’s did not manage to do this, and it didn’t manage to force through the dangerous speed-ups it was insisting on. This represents a real victory, not just for AFFCO workers, but for the whole workers’ movement. 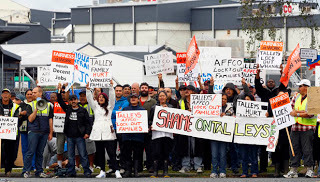 Multi-millionaire Kiwi capitalists the Talley family have launched an attack on freezing workers they employ at AFFCO plants in the North Island. Talley’s control a huge chunk of New Zealand’s food production and make fat profits. The freezing workers they employ are willing to fight for the right to a union contract. And that’s why they are under attack. “We’re gonna march, march, march to victory! We’re gonna fight right to the end! For workers’ rights, and freedom! Aue! 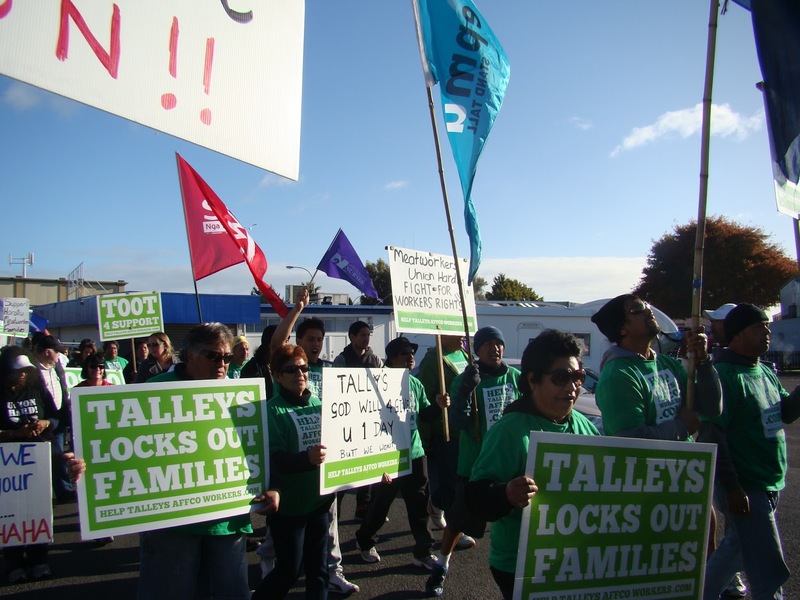 A new take on the folk song dedicated to the Māori Battalion echoed through the streets of Te Puke on Saturday as over 500 locked-out meat workers, whānau and supporters made their way through the town to cheer the workers and build support for their cause. Affco workers have been locked out of their jobs as bosses try to attack the rights of workers around the country. 776 union members employed at Affco-operated freezing works in the North Island were barred from work from the 29th of February. In a show of solidarity, more than 400 other workers walked off the job in solidarity with those that had been locked out. The company retaliated by extending the lockout to a further 250 workers in a plant that had not previously been locked out. The locked-out workers cannot return to work until the dispute is resolved. What an inspiration Ngaruawahia’s Whare family are to all unionists! 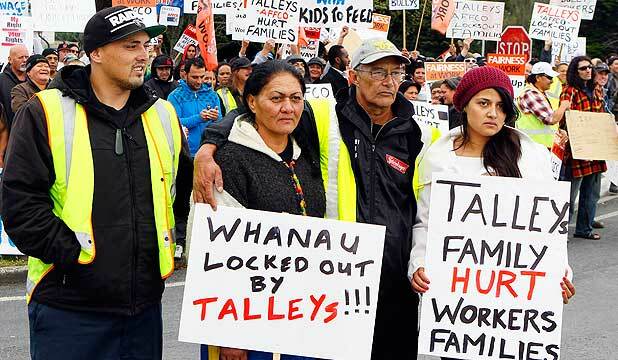 Kerry Whare junior, 22, and Maraea, 21 are two of over one hundred Meat Workers’ Union members who have been locked out by their bosses in an attempt to force through dangerous and physically exhausting speed-ups (“increased productivity” in code). 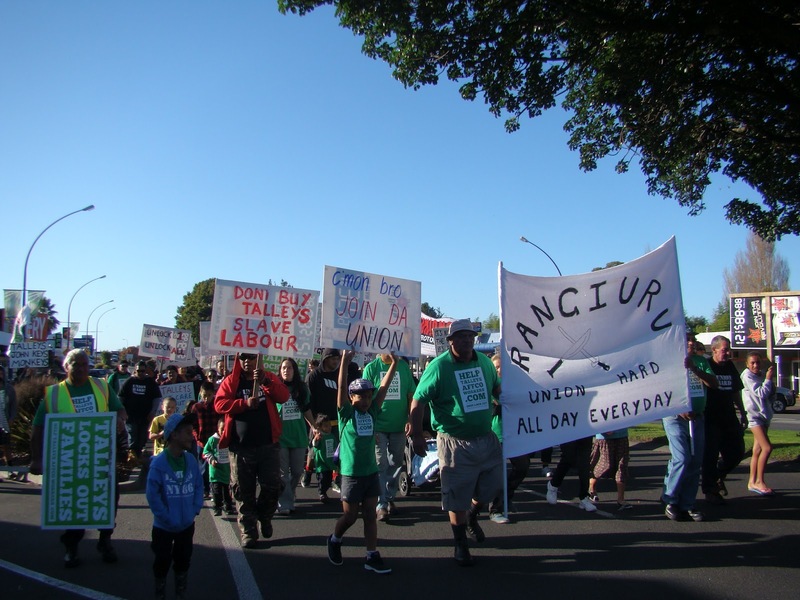 Their parents – Kerry senior and Rangi – are, with others in the union, on strike in support of their locked-out workmates.